The workhorse of the Aero Bote lineup! The Zeppelin has a new name that fits better in the Bote family of products, the 12’4 Rackham Inflatable or “iRackham”. It’s the same great platform as the Zeppelin, only this year it gets quite a few color options to give it a refined and polished look. If you’re into SUP Fishing or Expedition, the Rackham Inflatable was built for you and is full of features that will make your time on the water much better! It’s also a great option for someone who needs the ultimate in inflatable stability. At 38” wide and a max weight capacity of 415lbs, this board is solid under your feet!! One thing the iRackham has that all the other Aero Botes don’t is its duel receiver mounts. The receiver mounts are the attachment plates built into the board will allow you to use the optional receiver mounts to install Botes Tackle Rack, or the new Bucket Rack. With the Rackham Inflatable, you get two sets!! This really expands your options when configuring the perfect rig. The first set is just behind the standing area and the second is a few feet in front of you. Our favorite configuration is to use the Tackle Rack in the rear position and the Bucket rack to hold our Kula cooler in the front. Another feature the Rackham inflatable has that most of the other Bote inflatables don’t, is the accessory plate mount on the rear of the board. This plate allows the potential to mount a small motor and future Bote accessories. Extra Lashing Tie Downs: The iRackham gets a few extra tie down points to stow all that gear and keep it from shifting around while paddling. Sand Spear Attachments: These are attachment points built into the left and right side of the board that secure Botes optional Sand Spear system. The sand spear allows you to anchor your board in the shallows with the telescoping spear. Front and Back Bungee Systems: You get plenty of room to easily stow gear under the pre-installed bungees on the nose and tail of the board. Two Grab Handles: The Rackham is a big board, you get two solid handles to help lug it around depending on your needs. One is in the center and the other is near the nose. Travelink Carry Strap Compatible: As if there weren’t enough attachment points, you also get two lashing loops on each rail. The are designed to be used with Botes optional Travelink Carry Strap that aides in toting your board to and from the water when the path is long. Our Opinion: As paddle boarding grows and expands, people are wanting to go farther and push the limits of what they can do while on the water. The new Rackham Inflatable is the perfect solution for expedition paddling, SUP fishing or just to provide a VERY stable platform to paddle. It allows for more gear, which will equate to a better experience while on the water, and that’s what we are all looking for. If the iRackham seems a little big for your needs, check out our Bote 11’6 HD Inflatable or the 11’ Bote Flood Inflatable. Both are great options in a little smaller package. 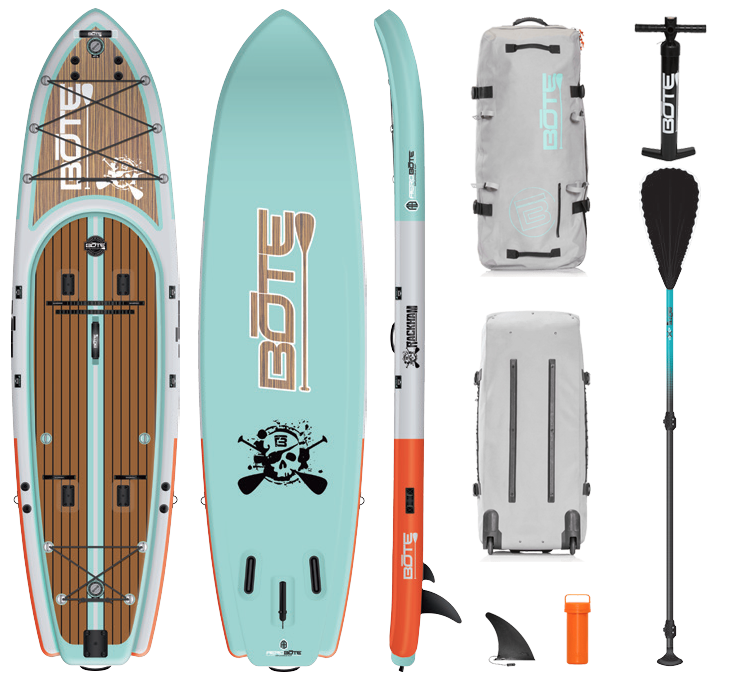 If you have any questions about which Bote Aero model is best for you, give us a call or reach out via our contact form by Clicking Here.